The Gentleman Crafter: Graphic 45 Extra Project Reveal For CHA! Hello Everybody! Happy Friday To You All! As promised, I would like to show y'all the extra project I did for Graphic 45's booth at CHA. I used Graphic 45's new Bird Song Collection! I really didn't think I was into Asian art, but folks, I'm totally in love with this collection! The colors are incredible, the graphics and patterns are marvelous! It's truly an amazing collection that Diane Shultz and Graphic 45 have come up with. 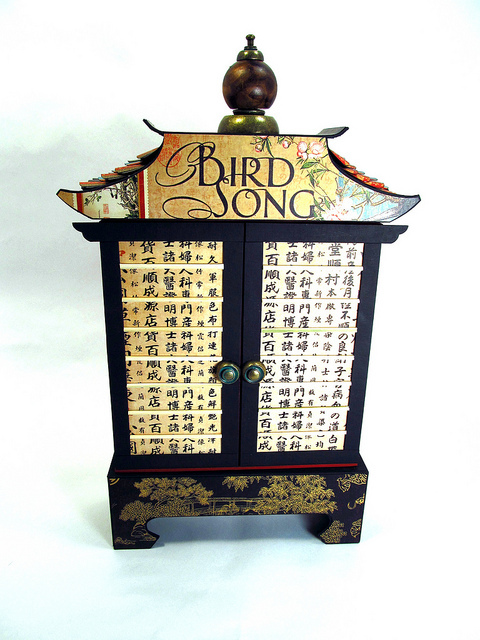 On with the project...I had a few pieces of Bird Song left over and I really wanted to come up with a reason to use shoji doors that would slide back to reveal one of Graphic 45's altered boxes. So that's when I thought a small house, temple or shrine. Here's what I came up with. The front showing the shoji doors that wrap around the middle box unit and slide back to open. 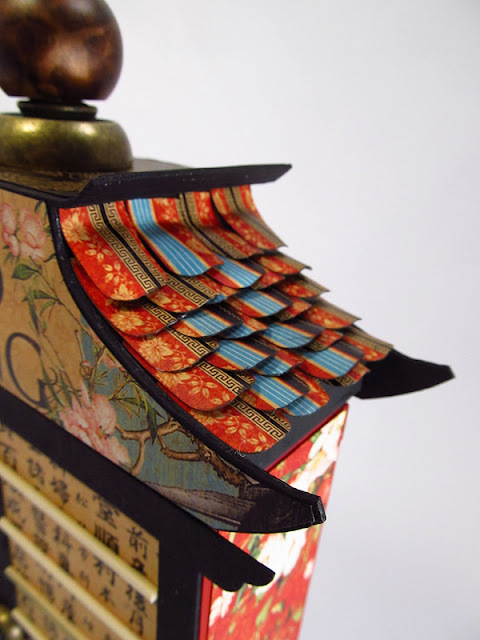 The doors were covered with paper, a chipboard frame and then bamboo skewers were added inside the frame. Finally, the doors were fitted with a set of Graphic 45 Button Brads for knobs. The roof was really the hardest part for me. Trying to get the right shape was a bear! So finally it hit me to draw it on cardstock. Once I was happy, I folded the cardstock in half, cut out the design and made a template to use to trace around on the Chipboard. I then cut out the piece twice for the front and back. Next, I cut the two side pieces, scored them on the back with a craft knife so the would bend and glued them to the front and back pieces. Last I just added a curled edge flat top roof. It's basically an upside down box with no lid...well, with wings jutting out! LOL! Finally, I cut roof tiles and used my corner chomper to round the edges and then rolled them around a dowel to get the "tile" shape. I wanted the altered box to be simple and hopefully elegant and this collection is sooo elegant, (Gotta love it!) so I used the border of the paper and made a frame and adhered it to the front of the box. 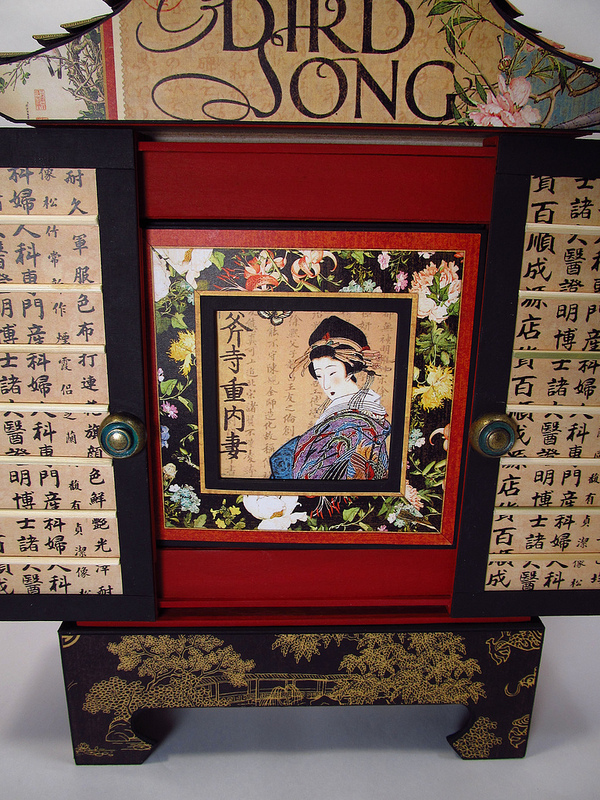 Next, I cut the beautiful geisha from the collection and placed that on the inside back of the open paneled Altered Art Box. Once again I was drawn by the beauty of the Asian ladies and placed this one on the inside of the box. Now, I'm not the best fussy cutter around, but I sure try to give it a go! I need some big boy scissors to make these cuts! My fingers will not fit into the blasted finger holes! LOL! The scissor I use now are what I believe looks like baby nail scissors for goodness sakes! Sorry :) ... OK where was I?..Yes, the inside...I wanted to give the inside a dimensional look, so I cut the geisha out of the paper collection, added a fan to her hand, (because I whacked off her fingers but don't tell anybody!) lined the box and then adhered her toward the front of the box. Next, I cut a purple plumb branch from outside and glued that behind her inside the back of the box. I then cut out multiple flower shapes, used my stylus to round them over and adhered the layers together for what I was hoping to look like cherry blossoms. OK, so they look more like Grapefruits, but I thought they looked nice! :) Actually, I loved these flowers so much I used them on a layout that one day, you all will see. Well That's it. I hope you liked it! It was my great privilege and honor to give this piece to a very beautiful and talented lady that has given me an incredible opportunity. I humbly thank you! Wow, so pretty! I'm sure the person will treasure it always because it was from you. She said she loved it. I can't tell you how happy it makes me when someone actually loves something and wants it! It's beyond happy really! Một mảnh thanh mang bao vây lấy Nhạc Thành, chân khí vận chuyển chậm rãi tu luyện, lần này đại chiến Nhạc Thành bị tiêu hao không ít chân khí, hắn lúc này muốn hảo hảo khôi phục lại, mà trong sơn động ngũ hộ pháp Hắc Ám thần điện cũng bị Nhạc Thành bày ra cấm chế ném ở bên cạnh. Một ngày sau, Nhạc Thành mới từ đan điền thở ra một ngụm trọc khí, trải qua một ngày một đêm điều tức chân khí, hắn cũng đã toàn bộ khôi phục, sử dụng âm dương kiếm cùng ám ảnh kiếm tiêu không ít chân khí, đặc biệt Nhạc Thành thực lực hiện tại mới là Kim Đan kỳ hậu kỳ mà thôi. Thực lực Kim Đan kỳ hậu kỳ, ở Hoa Hạ Tu Chân Giới cũng miễn cưỡng coi như thành tựu, nói như vậy ngay cả cao thủ cũng không tính, ở Hoa Hạ tu chân giới, khi đạt tới Nguyên Anh kỳ mới được cho là cường giả. Chậm rãi mở hai mắt, ánh mắt Nhạc Thành hướng về phía Hắc Ám thần điện ngũ hộ pháp. - Lúc này lên tìm manh mối đi. Nhạc Thành đứng lên, lập tức đi tới bên cạnh ngũ hộ pháp, trong tay thủ ấn mở ra cấm chế. - Ngươi muốn làm cái gì, ngươi mau thả ta ra. OMG Jim this is gorgeous. Looks like you fussy cut just beautifully. Wow this is amazing. What a beauty!!!!! You were right, it was well worth the wait. Now Jim you really do need to start doing patterns and even kits. Between you and Laura, we will be in debt up to our eyeballs!!! Lovely gift. Gorgeous paper. Super Design. Thank you so much Monika! I love me some details! LOL! Really, Thanks! Thanks SunFlower Lori! Appreciate you coming to look! WOW WOW!! Jim that is stunning! Your projects are always fabulous! I can't wait for your Ustream or Utube classes/ shows!! Will you be doing patterns and kits also? Looking forward to your next masterpiece! Thank you ArtJunkie!!! Yes, I will. I'll let you know when! Have an excellent weekend! Wow Jim - this is stunning! I have no idea how you got the doors to slide like that (I'm easily confused), it's amazing! The recipient is one very lucky lady. Thanks Lynn Lamb! You are such a sweetheart! I'm not good at explaining things in a hurry, but the doors work! LOL! How are the invites coming? anything I can help with? Hugs to you! Thanks again for all my treasures! I have so enjoyed them! Let us not forget about the yumminess of those goodies! Yahooo! P.S. Have you tried the Tim Holtz Tonic scissors? They have much larger handles and are really good. I use mine all the time for cutting out rubber stamps when I've mounted them on EZ Mount. They're non-stick coated on the blades and have a slightly serrated edge, which gives a good grip. (I should be on commission - LOL)! Lynn, I own three pair! Hahaha! Seriously three pair. They are the best truly. However, for me and fussy cutting Tim's seem to not be the best. Seems like I need really sharp pointed scissors. I saw some that would have been perfect at CHA but we were just passing by and never got the name! Poop! Oh well, Thanks for the tip though! Much appreciated! I LOVE THIS JIM... It is ELEGANT !!! I so love your work, every detail is amazing ( I wanna craft live you when I grow up ...LOL !! ), those shingles ...OMG ... the inside fussy cuts...WHEW ... gotta take a breathe... I seriously get so excvited looking at your stuff !!! You did Bird Song PROUD... you hear P-R-O-U-D !!! Wow Jim! This is beautiful! 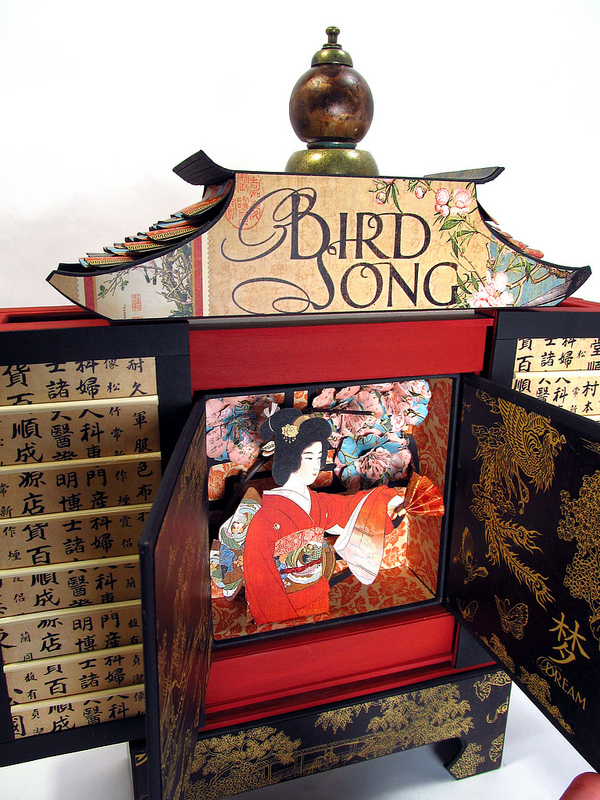 i love the doors with the bamboo, and the scene inside the box is awesome! Another great project! Jess, Thank you! I think it was you, are you feeling better? Didn't you go to the ER recently? If so, I'm thinking about ya! Hope all is well! WOW!!! This is another GORGEOUS project!!! It's simply stunning!! I love how the doors work and the scene behind them takes me right into Japan. Did you mention a class?!?!?! OOOOOO tell me more!!!! How about a video tour...love seeing how everything works. Hiya Barb! How's my other Georgetown neighbor? I wish I had thought about a video before I took it to CHA. I no longer have it as It was gifted there. Class is coming.....Thanks my sweet! WOW - this is gorgeous!! Not like all of your other ones aren't gorgeous too but wow!! This is really something else! This is beautiful Jim! What a wonderful gift! It reminds me of some asian dolls and jewelry box that my dad brought back when he was in the Navy. Thanks for sharing. Sharon, how cool you said that! Isn't it neat how a comment, smell, picture etc. can send you back immediately to a certain memory. When you wrote that I too was reminded how my grandfather gave my sisters a jewelry box. 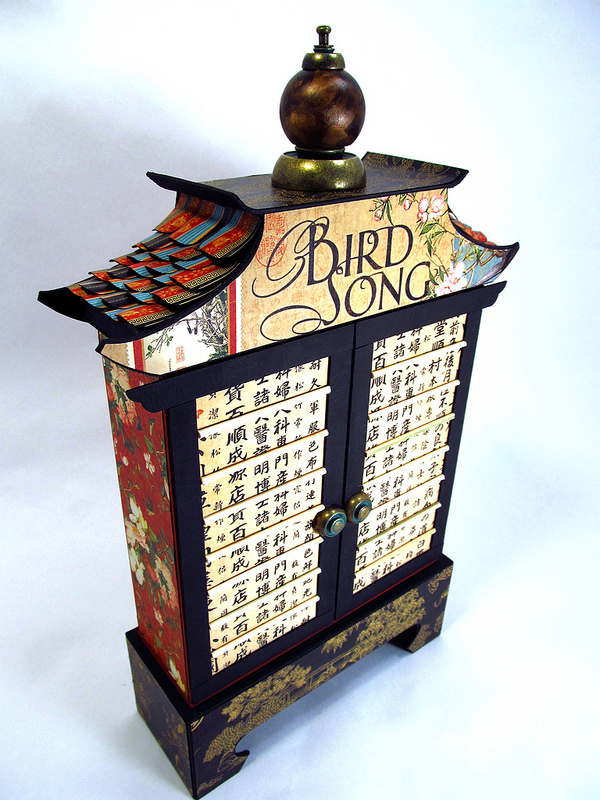 I can see it now, it was black highly lacquered and had a gold tree and possibly pagoda on the top. I would say very similar to the base of this project. How cool. Thanks for the memory. WOW Jim. I love this. I spent a month in China last year and have over 1400 photos I need to do something with. A piece like this with a hefty mini would be just perfect. I have been waiting for the right papers and I think these fit the bill. You are wonderful at this design stuff. You have blossomed, can you say that to a guy, over the last year. Keep it up!!! A gorgeous project for gorgeous papers! I love how you tell us about your "mistakes"--and then proceed to fix them or work around them. The sign of a true artist! Thanks Nan! I really think we should share our mistakes. Not only does it help us learn, but usually great things come from them. Poor Geisha! LOL! Jim, You've caputured it beautifully. How elegant! I'm just as impressed with the engineering of the project. I want to slide the doors very badly. lol. The shingles on the roof are perfect.I'm so glad you were able to gift it to someone who will love it. My 2 classes with Anna Dabrowska were fantastic. Her syle is so different from anything I've done but I just got home with a beautiful layout and covers for a journal. I hope you had a chance to see her work at CHA (Prima, I think). On second thought, you may not have had time to stop there. I know Tim is a big fan of her work. Even with little sleep ( she has a crazy schedule teaching in a different city and time zone every day) she is a great teacher and is good at pushing people (like me) out of their comfort zones. I'm so excited that you have so many followers in just a few short days. Very fun. Have a great weekend my friend. Good Mornin' Mo! So glad you like it! Yes, I was actually introduced to Anna by Linda Cain at CHA. We were all standing around watching Dyan work her magic with Dylusions ink sprays! What a very sweet lady. I did go and see her on the back wall of the booth. Amazing! You know one of my G45 Teamies, Tara Orr just took her class. She posted it on Facebook! It's amazing. The colors and tones of the project were incredible. Very cool! Would love to see yours! Send us some pictures! :) Please! Have an awesome weekend Mo! WOW!! That is so amazing! You have such an incredible eye for details. This is just stunning! Thank you for sharing. Thanks Dee! Thanks for looking! J. Thanks Steven! Thanks for helping me figure out how to embed my video! Have a good one! This is just down right STUNNING!!! A true work of art Mr Jim! Cassandra, I need to bottle you and bring you with me everywhere I go! You are pure Sunshine! Absolutely amazing!! a fantastic piece of work, can't wait for the new papers to fly over the pond!! Thanks Maureen! You're gonna love them! I wish I had some too! I've used up my sample pages! Ready for more as soon as they come out! So elegant, Jim! I'm in awe as to how you can manipulate chipboard and cardstock! My mom always taught me that when you give something made with your hands, you share your heart, and that's truly evident in this masterpiece. What a beautiful gift to give someone! Gail, That's so true! I love to give gifts! I'd rather give than get honestly! I love handmade goodies! Thanks for saying that! Another absolutely stunning piece. Your engineering skills are working overtime. Love the creative touch with the fan. I say there is no such thing as a mistake in craft, just unplanned creative opportunities. Ursula! So true....Creative Opportunities! Thanks my friend! Wow!! I love the way this project keeps opening and revealing such beautiful art. Thank you! The paper is art! Graphic 45 does an amazing amazing job at making beautiful papers that we can use for so many thing! Thank You! I have to say when I saw that those doors slide open, I almost fell out of my chair! Jim you continue to astound me with your creative muse. This one is just truly amazing! Wow just wow! This project is incredible. Thanks so much for sharing. Love, love, love how the doors open! Nan, you will LOVE it. There is a blue paper in the collection that I believe is called Cherry Blossom. GORGEOUS! All of them are really excellent! Pagoda here you come! Yahooo! Holy cow! This is fantastic. Sliding doors? Incredible! I did not think I was into Asia Art either but you may have changed my mind. This was really great and worth the wait, thanks for sharing. Cyndie! Well, thanks for coming over to visit! I appreciate your kind words. Keep coming back! Good to see you here! Yes, each side (door) is actually a box. Think of two shoe boxes set on their ends. Now push these shoe boxes together until they kiss and that's how I made the doors. The boxes are wide enough to go around the main-middle unit. So it's like a box within a box. Thanks Dori for asking the question! Thanks Sweetad! WOW! I'm flattered. Love ya too! Have an awesome weekend! Once again you've surpassed all expectations and frankly I'm out of adjectives. Request: Can you please think up some different style mini albums. I need something different.... interesting.... interactive...... stunning..... different.... Thanks and I'll be waiting. Such pressure MrsJudys! LOL! I will! Good Challenge for me! Thanks you for the suggestion as well as the wonderful compliment! You are making my Christmas gifts so easy to do this year! My daughter in law loves anything oriental, so this is a shoe in :) Now I have to finish up the tag armoire, find your lighthouse pattern and make two of those, and now this. Guess I am going to have to give up following all my favorite paper crafters save one or two (yes I won't stop with you lol) Thanks again Jim for your wonderful ideas and work! LOL! Cindy! I know we better get crackin'! Times a flyin'! You just make amazing pieces! This is beautiful! Thank you for sharing your talent. Oh Evelyn Thanks! I appreciate it! Dr. E! I know, I know! I will! I miss you guys! Thannk you E! Well, my friend, if you were aiming for elegance and delicacy, you hit the nail on the head. This piece just oozes elegance, and the design is so pleasing to the eye. I'm so impressed with the sliding doors! I just have one question for you....when do you sleep? Thank You Kathy! Elegancy and delicacy...Going for elegance...But delicacy...More like a bull in an China cabinet! Get it...Ok, maybe it's not funny! I love your project, I'm just not into Asian. I expressed this to Graphic 45. I wish them luck but don't see this as a big seller. I think it might have been in at one time, but not now. Thanks for sharing Jim. Thanks again for your comment and I hope you have a most excellent weekend! As always, I so appreciate your comments! I'm going to do it if I have to sell my car to get a longer satellite antennae! It's 40 foot tall know! Ustreams are coming, I promise! Hi Jim, clearly Graphics 45 made a huge mistake. They don't need 15 other designers....they only need YOU! Your project is spectacular. You are certainly giving a certain other gentleman whose initials are TH a run for his money. Keep up the great work. The projects are friggin awesome. Anita. Hi Jim, Thank goodness I've found you again. The last I heard you were Austin bound, then nothing. I have been following via the bloglovin phone app. & it didn't show your entries about difficulties & moving your blog. 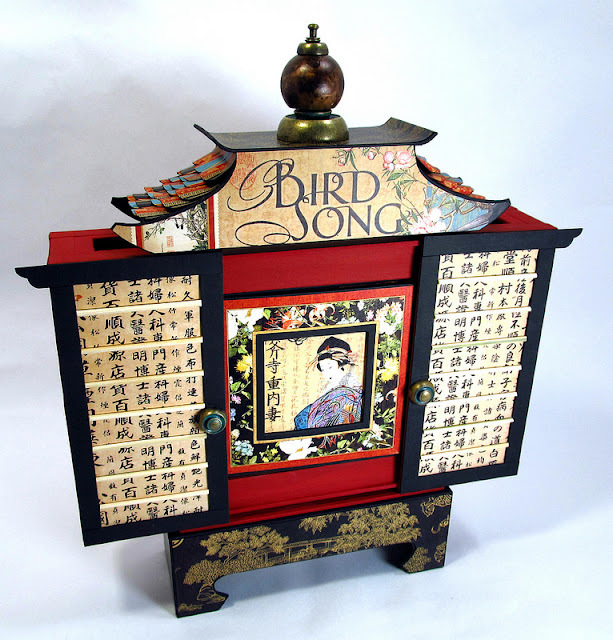 Just think I could have missed out on seeing your haunted gated house or this amazing oriental box. Have fun playing with the flitterglu. It is amazing for foiling. Thanks for all the inspiration. THERE YOU ARE!!! Found you again! 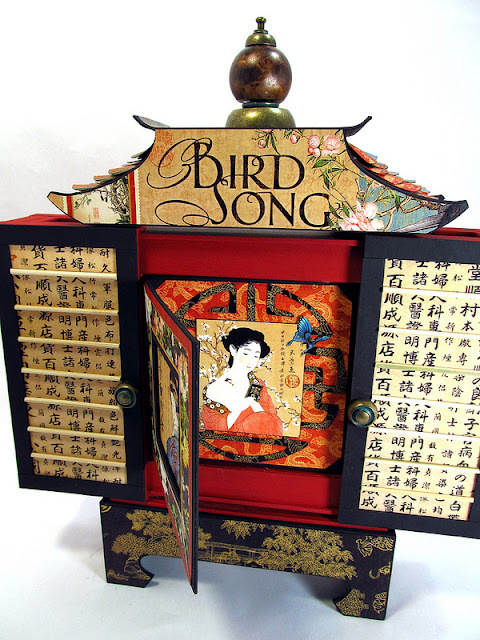 I just finished a project with the Birdsong papers I got at CHA...I'm so lucky...and now I've seen your' drop-dead-gorgeous piece using it. May I just say.......STUNNING!!!! You KNOW I love it! Beautiful piece, Jim! lovin' it! I had the same problem with your blog feed disappearing. I was praying nothing happened to you all week. Your project is drop dead gorgeous. My grand daughter is totally into anything Oriental and she would love it if I could make her something out of this paper as wonderful as your shrine. Thanks as always for sharing. Jim, once again, this is stunning. Your modesty in regards to fussy cutting is adorable. That is some pretty amazing fussy cutting if you ask me. Wonderful job and so happy to have found your blog for inspiration! Talented!!! OH MY GOSH . . . this is truly an absolutely STUNNING work of art! When I saw this piece I immediately thought of my mother-in-law and knew she would have loved it. I hope that you will be creating a tutorial as I would love to make one for my daughter for her to place keepsakes in from her grandma! Jim this is just Amazing, you did a great Job with all the fussy cutting. Thank you so much for sharing. Just curious, are you really this humble or do you genuinely not realize how unfreakinbelievably talented you are? You are a paper crafting God. I love this project, all I can say is WOW! You are such amazing crafter, keep up the amazing projects! Jim, I must have really been asleep. I'm just noticing this gorgeous project of yours. Why did this one slip past me. My sister would die to have this if she saw it. Did you do a tutorial on it. Please say yes?